GENUINE NUMATIC 32MM CARPET & RUG FLOOR CLEANING WAND ATTACHMENT. From a Trusted Specialist Numatic Sales, Service & Spares Dealer since 1987 - your assurance of Quality, Experience & Expertise. 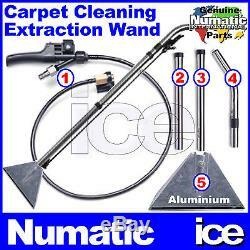 Genuine/Original Numatic 32mm Carpet Cleaning Wand Attachment. Fitted with current-issue 9mm male spigot - for 2004 onwards machines. Fits Numatic Models like George, CT 370, CT 470, CTD 570, CTD 900 etc. 5-Piece Set Includes: Trigger Valve, Solution Tube & Spray Nozzle. 3-piece Stainless Steel Suction Tube Set. Parts simply slot together for easy set-up and dismantling. Bargain Price - Save nearly 45% off Numatic List Price. Direct from Numatic - Quality Assured. Version with PLASTIC See-Thru Fishtail Suction Head also available in other listings. A Full VAT Invoice will be supplied with every sale. Usually despatched sameday if ordered by 1pm Mon-Fri. Highlands, Islands, Nth/South Ireland may cost more or sent via slower Parcel Force 48. ICE Limited - a Specialist KARCHER & NUMATIC Sales, Service & Spares Dealer since 1987. The item "NUMATIC 32mm CARPET CLEANING MACHINE ALUMINIUM FISHTAIL FLOOR CLEANER WAND TOOL" is in sale since Sunday, March 18, 2012. This item is in the category "Home, Furniture & DIY\Appliances\Ironing & Vacuuming\Vacuum Cleaner Parts". The seller is "ice-limited" and is located in Chessington, Surrey.